The Los Angeles Times (also known as the LA Times) is a daily newspaper published in Los Angeles, California, and distributed throughout the Western United States. Founded in 1881, it was bought by Harrison Gray Otis and quickly became successful. Long dominated by the Chandler family, beginning when the son-in-law of Otis, Harry Chandler, took over, it saw an era of increasing circulation and, under the fourth generation (Otis Chandler), development into a model of balanced and comprehensive journalism. After the Chandler era, the paper was purchased by the Tribune Company (which itself was later sold), owners of the Chicago Tribune, and has struggled in an attempt to regain its status. The Times has won 37 Pulitzer Prizes; this includes four in editorial cartooning, and one each in spot news reporting for the 1965 Watts riots and the 1992 Los Angeles riots. In 2004, the paper won five prizes, which was the second-highest number by any paper in one year. The newspaper was first published as the Los Angeles Daily Times on December 4, 1881, but soon went bankrupt. The paper's printer, the Mirror Company, took over the newspaper and installed former Union Army lieutenant colonel Harrison Gray Otis as editor. Otis made the paper a financial success. In 1884, he bought out the newspaper and printing company to form the Times-Mirror Company. Otis' editorial policy was based on civic "boosterism," extolling the virtues of Los Angeles and promoting its growth. Towards those ends, the paper supported efforts to expand the city's water supply by acquiring the watershed of the Owens Valley, an effort (slightly) fictionalized in the Roman Polanski movie, Chinatown. Otis also was staunchly Republican, which was reflected in the paper's editorial and news content. Historian Andrew Rolle called Otis "the single most important force in Los Angeles aside from government itself." Rubble of the Times building after the bombing. 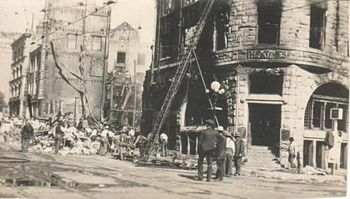 The efforts of the LA Times to fight local unions led to the October 1, 1910 bombing of its headquarters and the home of Otis, killing 21 people. Two union leaders, James and Joseph McNamara, were charged with the murders. The American Federation of Labor hired noted trial attorney Clarence Darrow to represent the brothers, who eventually pleaded guilty, although supporters then (and since) believed the two men were framed. The paper soon relocated to the Times Building, a Los Angeles landmark. On Otis' death in 1917, his son-in-law, Harry Chandler, took over the reins as publisher of the LA Times. Harry Chandler was succeeded in 1944 by his son, Norman Chandler, who ran the paper during the rapid growth of post-war Los Angeles. Norman's wife, heiress, and fellow Stanford University graduate Dorothy Buffum Chandler, became active in civic affairs and led the effort to build the Los Angeles Music Center, whose main concert hall was named the Dorothy Chandler Pavilion in her honor. Family members are buried at the Hollywood Forever Cemetery near Paramount Studios. The site also includes a memorial to the Times building bombing victims. The Los Angeles Times building as seen from Grand Ave.
By the mid-1940s, the Los Angeles Times was the leading newspaper in terms of sales in the Los Angeles metropolitan area. After World War II, it launched The Mirror, an afternoon tabloid to compete with Hearst's Herald-Express. The Mirror absorbed The Los Angeles Daily News in 1954 and ceased publication in 1962, when The Herald-Express was merged with the morning Los Angeles Examiner. Otis Chandler, the fourth generation of the family publishers, ran the paper from 1960 to 1980. Otis Chandler sought legitimacy and recognition for his family's paper, often forgotten in the power centers of the northeastern United States due to its geographic and cultural distance. He sought to remake the paper in the model of the nation's most respected newspapers, notably The New York Times and The Washington Post. Believing that the newsroom was "the heartbeat of the business," Otis Chandler increased the size and pay of the reporting staff and expanded its national and international reporting. In 1962, the paper joined with the Washington Post to form the Los Angeles Times-Washington Post News Service to syndicate articles from both papers for other news organizations. During the 1960s, the paper won four Pulitzer Prizes, more than in the previous nine decades combined. In 1989, its last rival for the Los Angeles daily newspaper market, The Los Angeles Herald Examiner, went out of business, making Los Angeles nominally a one-newspaper city. However, in the suburban neighborhoods of the San Fernando Valley, the LA Times still competed with The Valley News and Greensheet, which later renamed itself The Daily News of Los Angeles to compete with the LA Times. The LA Times has an Orange County edition (with its own printing presses and editorial staff) that competes with the Santa Ana, California-based The Orange County Register. La Opinión, a Spanish language daily newspaper previously owned by the LA Times for several years in the 1990s, also has a sizable circulation. The paid circulation figures for the Los Angeles Times have decreased since the mid-1990s, becoming unable to pass the one million mark that was easily achieved in earlier decades. Part of the reason for the circulation drop may be from the actions of a succession of short-lived editors. They were appointed by publisher Mark Willes, who took the paper in controversial directions after Otis Chandler relinquished day-to-day control in 1995. Willes, the former president of General Mills, was criticized for his lack of understanding of the newspaper business, and was derisively referred to by reporters and editors as "Captain Crunch." Other possible reasons for the circulation drop include an increase in the single copy price, the rise in readers preferring to read the online version instead of the hard copy, and a perception by some readers that the LA Times is either too liberal or too conservative for their tastes. In 2000, the Times-Mirror Company was purchased by the Tribune Company of Chicago, ending one of the final examples of a family-controlled metropolitan daily newspaper in the U.S. (The New York Times, The Seattle Times, and others remained). John Carroll, former editor of the Baltimore Sun, was brought in to restore the luster of the newspaper. During his reign at the Los Angeles Times he eliminated more than 200 jobs, but it was not enough for parent company Tribune. Despite operating profits of 20 percent, the Tribune executives were unsatisfied with returns and by 2005, John Carroll had left the paper. Dean Baquet replaced John Carroll. Baquet was the first African-American to hold this type of editorial position at a top-tier daily. Subsequently, Baquet was himself ousted for not meeting the demands of the Tribune Group—as was publisher Jeffrey Johnson—and replaced by James O'Shea of the Chicago Tribune. Under Carroll and Baquet's leadership, the paper won 13 Pulitzer Prizes, more than any other paper except the New York Times. The paper's content and design style has been overhauled several times in attempts to help increase circulation. In 2000, a major change more closely organized the news sections (related news was put closer together) and changed the "Local" section to the "California" section, with more extensive coverage. Another major change in 2005 saw the Sunday "Opinion" section retitled the Sunday "Current" section, with a radical change in its presentation and columnists featured. There are regular cross-promotions with co-owned KTLA to bring evening news viewers into the LA Times fold. In early 2006, the paper closed its San Fernando Valley printing plant, leaving press operations at the Olympic Plant and Orange County. Also in 2006, the LA Times announced its circulation at 851,532, down 5.4 percent from 2005. This circulation drop was the highest out of the top ten newspapers in the U.S. Despite this recent circulation decline, many in the media industry have lauded the newspaper's effort to decrease its reliance on "other-paid" circulation in favor of building its "individually-paid" circulation base, which showed a marginal increase in the most recent circulation audit. This distinction reflects the difference between, for example, copies distributed to hotel guests free of charge (other-paid) versus subscriptions and single-copy sales (individually-paid). In December 2006, a team of Times reporters delivered management with a critique of the paper's online news efforts known as the Spring Street Project. The report, which condemned the Times as a "web-stupid organization," was followed by a shakeup in management of the paper's Web site, Latimes.com, and a rebuke of print staff who have "treated change as a threat." On April 2, 2007, the Tribune Company announced its acceptance of Sam Zell's offer to buy the Chicago Tribune, the Los Angeles Times, and all other company assets. Zell announced plans to take the company private and sell off the Chicago Cubs baseball club. The paper reported on July 3, 2008, that it planned to cut 250 jobs by Labor Day and reduce the number of published pages by 15 percent. That included about 17 percent of its news staff as part of the newly private media company's mandate to slash costs. Since Zell bought the Tribune Company, the paper has been struggling to deal with a heavy load of debt. The changes and cuts have been controversial, prompting criticism. One of the LA Times' best-known columns is "Column One," a feature that appears daily on the front page on the left-hand side. Established in September 1968, it is a place for the weird and the interesting; in the How Far Can a Piano Fly? (a compilation of Column One stories) introduction, Patt Morrison writes that the column's purpose is to elicit a "Gee, that's interesting, I didn't know that" type of reaction. The LA Times also embarked on a number of investigative journalism pieces, researching and dissecting a certain scandal or unfavored part of society. For example, a series in December 2004 on the King-Drew Medical Center led to a Pulitzer Prize and a more thorough coverage of the hospital's troubled history. More recently, journalist Steve Lopez wrote a five-part series on the civic and humanitarian disgrace of Los Angeles' Skid Row. Outside of the city of Los Angeles proper, the LA Times also competes against several smaller daily papers in nearby Southern California cities. Examples include The Long Beach Press-Telegram, The Daily Breeze (South Bay), The Ventura County Star, The San Gabriel Valley Tribune, and The Pasadena Star-News. In the 1990s, the Los Angeles Times attempted to publish various editions catering to far flung areas. Editions included a Ventura County edition, an Inland Empire edition, a San Diego County edition, and a "National Edition" that was distributed to Washington, D.C. and the San Francisco Bay Area. The National Edition was closed in December 2004. Of these, only the Inland Empire and Ventura County editions remain, although nearby areas such as Bakersfield, Las Vegas, Barstow, and Needles still sell the LA Times at selected newsstands. Some of these editions were folded in to Our Times, a group of community newspapers included in home delivery and newsstand editions of the regular Los Angeles Metro newspaper. Remnants of Our Times are the Times Community Newspapers that are inserted on a regular basis in some areas of the Los Angeles Times. Times Community Newspapers are primarily independent local newspapers that were purchased by the Los Angeles Times during its expansion phase, but have a large enough readership and advertiser base to be continued. These include the News Press in Glendale, the Leader in Burbank (and surrounding areas), the Sun in La Crescenta and surrounding regions, the Daily Pilot in Newport Beach and surrounding cities, and the Independent in Huntington Beach. Since 1980, the Los Angeles Times has awarded a set of annual book prizes. There are nine categories: biography, current interest, fiction, first fiction (the Art Seidenbaum Award added in 1991), history, mystery/thriller (category added in 2000), poetry, science and technology (category added in 1989), and young adult fiction (category added in 1998). The Book Prize program was founded by the late Art Seidenbaum, a Los Angeles Times book editor from 1978 to 1985; an award named after him was added a year after his death in 1990. The Robert Kirsch Award, named after the longtime LA Times book critic who died in 1980, is presented annually to a "living author with a substantial connection to the American West whose contribution to American letters deserves special recognition." Works are eligible during the year of their first U.S. publication in English, though English does not have to be the original language of the work. The author of each winning book and the Kirsch Award recipient receives a citation and $1,000. The credibility of the LA Times suffered greatly when it was revealed, in 1999, that a revenue-sharing arrangement was in place between the LA Times and Staples Center in the preparation of a 168-page magazine about the opening of the sports arena. The magazine's editors and writers were not informed of the agreement, which breached the "Chinese wall" that traditionally has separated advertising from journalistic functions at American newspapers. Publisher Mark Willes also had not prevented advertisers from pressuring reporters in other sections of the newspaper to write stories favorable to their point of view. Michael Kinsley was hired as the Opinion and Editorial (Op-Ed) Editor in April 2004 to help improve the quality of the opinion pieces. His role was controversial, as he forced writers to take a more decisive stance on issues. In 2005, he created a Wikitorial, the first Wiki by a major news organization, which allowed readers to combine forces to produce their own editorial pieces. The attempt was an embarrassing failure. Kinsely resigned later that year. In March 2007, the LA Times faced rumors that publisher David Hiller suggested and approved former Secretary of Defense, Donald Rumsfeld, with whom Hiller has close personal and business contacts, for a guest editorial position at the newspaper. ↑ 1.0 1.1 Dennis McDougal, Privileged Son: Otis Chandler and the Rise and Fall of the L.A. Times Dynasty (Cambridge, MA: Da Capo, 2002). ↑ Lost Angeles Times, The Times' Awkward Family Squabble. Retrieved April 9, 2007. 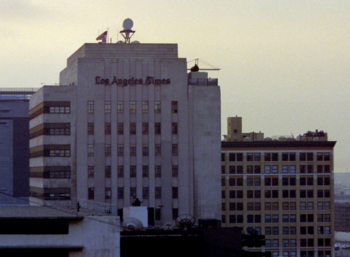 ↑ Los Angeles Times, Los Angeles Times Announces Editor Succession. Retrieved April 25, 2007. ↑ USA Today, Newspaper sales dip, but websites gain. Retrieved April 9, 2007. ↑ Los Angeles Times, Book Prizes home page. Retrieved May 23, 2007. ↑ Salon, Meltdown at the L.A. Times, 1999-11-05. Retrieved April 26, 2007. ↑ Dan Glaister, June 22, 2005, "LA Times 'wikitorial' gives editors red faces," The Guardian. Retrieved May 7, 2008. ↑ Deadline Hollywood Daily, LA Times Publisher's Friend and Tribune Co Ex-Director Don Rumsfeld was asked to Guest-Edit after Grazer, 2007-03-25. Retrieved April 26, 2007. Ainsworth, Edward Maddin. 1940. History of Los Angeles Times. Gottlieb, Robert. 1977. Thinking Big. New York: Putnam. Halberstam, David. 1979. The Powers That Be. New York: Knopf. ISBN 9780252069413. Hart, Jack R. 1981. The Information Empire: The Rise of the Los Angeles Times and the Times Mirror Corporation. Washington, DC: University Press of America. ISBN 9780819115812. McDougal, Dennis. 2002. Privileged Son: Otis Chandler and the Rise and Fall of the L.A. Times Dynasty. Cambridge, MA: Da Capo. ISBN 9780306811616. "Interview With Dean Baquet" article. History of "Los Angeles Times"
This page was last modified on 25 July 2018, at 16:26.